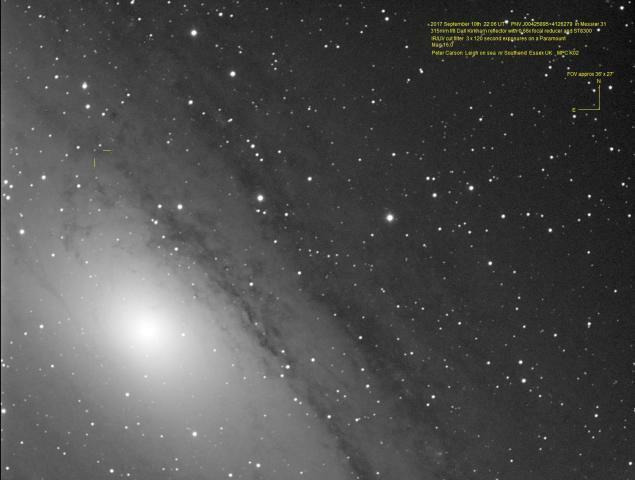 UK observer George Carey has discovered a variable object in M31 (see the TOCP report). I imaged it last night and it is currently around 17.0R. We would like to get a spectrum to confirm whether it is a nova. Is this too faint for amateur spectroscopy? Thanks Robin. If you do get a clear slot it would be worth a try. George imaged it again last night and the object has brightened to around mag 16. Richard Miles has a spectrograph job on the 2.0-m FTN which is currently scheduled for this morning. More accurate measurements of the nova give a magnitude of 16.6 for 11pm last night. Richard Miles tells me that the 2.0m FTN has acquired a spectrum using the FLOYDS spectrograph. The raw data will be processed after the telescope closes for the night. Richard sent me the attached image showing the raw spectrum which doesn't mean a lot to me at the moment but presumably will make more sense once it is rectified and calibrated. Many thanks to Richard for arranging this. There's an interesting article on spectral confirmation of novae here. Any comments from the spectroscopists on this forum would be very useful. The author of the article,Francois Teyssier is the resident expert amateur on CV spectroscopy in the ARAS group. He publishes a nominally monthly newsletter on the group's activities in this area. There have been a number of nova confirmations by amateurs recently and followup up spectra tracking the evolution of some targets. We have been getting a lot of support interpreting the data from professional Steve Shore. We've received the calibrated 2D spectrum which was obtained by Richard Miles using the FTN but can't make much sense of it. One of the FITS files is attached and if anyone has any insight it would be appreciated. According to the FITS header I think the left hand end corresponds to 474.2 nm and the scale is 0.3511 nm/pix. This would put H-alpha at around X=518 but there is no sign of anything there. I need to delve into the FLOYDS documentation but if anyone has any ideas I'd be very pleased to hear them! I'll have a try at extracting it from the background. I don't understand where all the emission lines in the sky background come from though. They do not look like galactic lines to me. Do they have an unusual light pollution problem or something or perhaps they superimpose the calibration lamp spectrum? EDIT: ok the "emission lines" are actually severe fringing in the IR. I can see the O2 telluric band so should be able to cross check the wavelength calibration. I used Maxim to simply draw a profile. Would I be right that the main line on the left is hydrogen? 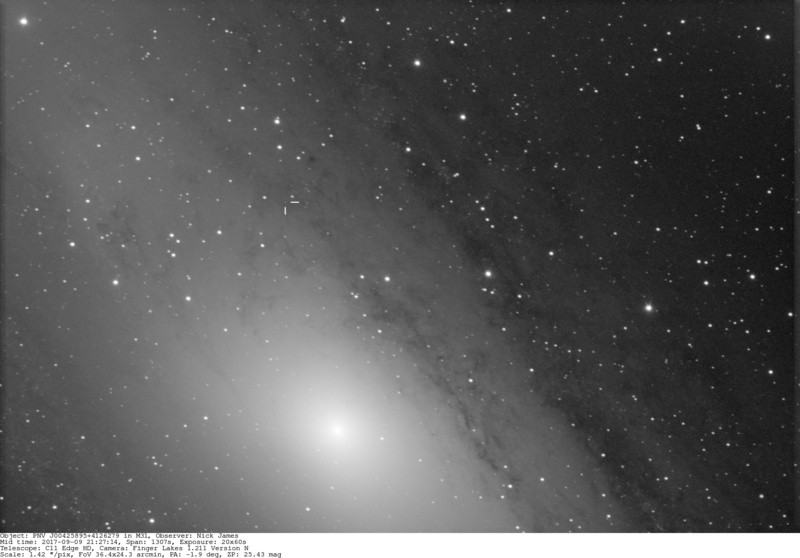 Your plot includes the sky background (from air glow, light pollution and from M31) which dominates the spectrum. The strong emission lines are airglow and light pollution. To see the target spectrum you need to just select the target spectrum (the narrow band) subtracting the background first. If you look at my sky background subtracted and wavelength calibrated spectrum you can see there is no emission line, including at H alpha (6563A) currently. Attached are the spectra with and without sky background subtraction, (pink and blue respectively, to the same Y scale). The spectrum beyond ~7700A (~pixel 500) is unusable in its current state because of the severe optical etalon type interference fringes, common in IR spectrographs. A careful flat correction would be needed to remove them. Many thanks for all of your help with this. An interesting result and a very steep learning curve for me! I know the feeling. I've been doing astronomical spectroscopy for over 10 years now and the curve has still not tailed off yet ! Note, I suspect the spectrum will not have been corrected for instrument response/extinction so the shape of the spectrum will not represent the actual spectral energy distribution. There may be some spectra of standards around taken on the same night though which could be used to produce a (relative) flux calibrated spectrum to give us an idea of temperature. I have been lucky so far and have obtained images each night since the discovery - sadly tonight has 0% chance. I think the nova will be reaching maximum about now (pure guesswork). On Saturday it looked like clouds would prevail so I tried the remote telescopes in Spain but the images were awful - poor focus and tracking. They refunded the units used so I might try again tonight. Using a remote telescope in Spain I got 6x120 seconds of fairly reasonable images. The Liverpool telescope has confirmed that the object is a classical nova and a member of the FeII spectroscopic class. I am glad they got this done - the nova is fading fast and is almost beyond my detection.